The belt buckle is the centerpiece of any belt, so why not choose one that shows off your unique personality. At Gavere Leather we have a wide variety of belt buckles available to compliment anyone’s style or taste. Choose from ornate two or three piece western belt buckle sets for a formal style western belt, or choose a confederate belt buckle for a more casual look. We have hunting belt buckles, music themed belt buckles, even cowboy and cowgirl belt buckles. Whether you’re looking for the perfect match for a new leather belt, or you’re looking to replace an old belt buckle, our western belt buckles for women and men offer something for everybody. 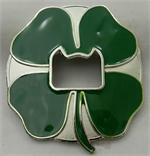 Shop our selection today to find great prices on a variety of eye catching belt buckles. We can help you find a unique buckle you’re sure to love, or even personalize a leather belt buckle with your name or initials at no extra cost!